Your standard Italian vegetable soup: nothing frilly or fancy...just a good, wholesome, healthy, warming meal. 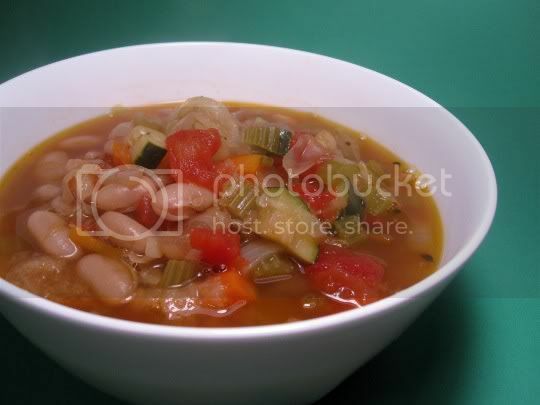 Shredded cabbage, onion, carrots, celery, and fresh thyme sprigs are sauteed in olive oil, then simmered with vegetable stock, zucchini, tomatoes, potatoes, and cannellini beans. That's it...no seasoning, no herbs, and little flavor on its own (so make sure you use a good stock). Stale bread is added toward the end of cooking for thickener, but I found mine pretty much just got soggy and stayed in clumps. Still a good addition to give the soup some unexpected texture, but nothing major. You're going to need a lot of extra seasoning (read: SALT) for the finished product, but that's okay: with all the negative hype that adding salt to food gets, I find that just the right amount actually brings out the flavor of things. And letting this soup sit overnight in the fridge makes for even better leftovers. It becomes slightly sweet, slightly thickened, and a lot more appetizing. For a complete meal, I'd pair this with a sandwich or nice hunk of crusty bread. Make again? Although this was good, probably not. I do enjoy more snazzy and exciting meals.